is a decent smoker, and this pretty much sums it up. It is not the best, but it is not bad. It will be there for you, not really impressing you, but never letting you down. For the price range of $150-200 it does what it is supposed to do: smoke meat for you. And you won’t get the ‘you have to fix this yourself, right after buying it’ syndrome, which is always a huge plus. 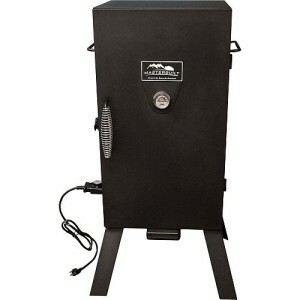 So what you get is a smoker with three racks, which provides an appropriate amount of space for your cooks and an adjustable thermostat for controlling the temperature. This is a little bit archaic if you think about it. They could have gone with digital, but it gets the job done. If you want to have a set temperature that you just place it at (let’s say 225F) you can just mark it with a sharpie on the dial so you don’t have to keep adjusting it every time you start smoking. You also get a removable grease pan, a wood-chip tray and a water pan, all three being very nice additions. The wood-chip tray and the water pan are somewhat small, but they can be replaced. And you also get a temperature gauge in the door, so you know how the inside of the smoker is doing. But the real downside to the wood-chip tray and the water pan is that you have to open the door to fill them up, which means that you lose heat each time you’re doing it. Fortunately, the tray size works well with the size of the smoker, so you won’t have to do it often. Now, there is nothing really that much wrong with the Masterbuilt 20070210 30-Inch Black Electric Analog Smoker but it could be better. The big advantages it has are the low price and its sturdiness. Most customers seem very happy with it, and there is no real over the top reason not to be. The trays can be replaced with bigger trays, there is no temperature leakage (or not much anyway) and the end result, the most important thing, comes out delicious. With these being said, the price of $150 (if you can find it at a sale even better) is what justifies purchasing the Masterbuilt 20070210 30-Inch Black Electric Analog Smoker. Sure for an extra $50 you could get some extra features, like a digital thermostat, and tray that can be fed without opening the door of the smoker, but like I’ve said the end result is what matters, and the end result will be pretty much the same. In this case it’s all comes down to features. Are you willing to forego the leisure that modern technology provides, so that you have an extra 50 bucks in your pocket? That, my friend, is a question that I cannot answer for you. You must look deep down inside and figure it out for yourself.